We are a lighting and furniture design production firm. Our Commercial& Residential Lighting fixtures are made of the finest materials and is individually handcrafted by our artisans. What says “Welcome” more than a giant glass chandelier? Stained-glass Moroccan lamp with carved motives can be a bolder more extravagant way to spice up your space. With Moroccan lamps, also referred as Moroccan lanterns. You can introduce a little eclectic flair in virtually any existing concept you may already have. Stained-glass lanterns create geometric Moorish patterns wherever the light shines through the panes of glass. Therefore, these two different types of Moroccan lighting will create different moods. Pierced metal hanging lantern. These really come alive when lit casting a wonderful array of shadows. Our Moroccan lighting clients based in California, New York, Florida love our items. Medina lights are handmade by our local artisans in Morocco using century-old traditions passed from father to son. They also come in different shapes, Moorish designs, and sizes. The colored glass of these lanterns comes in different colors that will either match any home decor or accentuate it. The light glowing through the hand-carved metal magically reflects through the Moroccan-style colors, making walls and ceilings breath-taking. If you already have wrought iron or rustic furniture, then get one of those cool hand hammered Moroccan chandeliers from MEDINALIGHTS.COM. A Moroccan Chandelier is the perfect option that would delightfully enhance that sense of magic and warmth that only Moroccan chandeliers can accomplish. Nothing conjures up the feeling of Medina nights, quite like a beautiful Moroccan lantern, with the jewel like colors dancing around your room and the soft intricate patterns of light cast on the ceiling. We have pulled together wide range of Moroccan lanterns with glass, including brass, silver effect, iron and antique effect. MEDINALIGHTS.COM have a wide range of Moroccan lanterns without glass, some of these are ideal for a patio and will have you transported to the Riyad in no time. Others will create a magical effect with a myriad of patterns cast on your ceiling. Our selection of lamps includes iron, brass and silver effect. 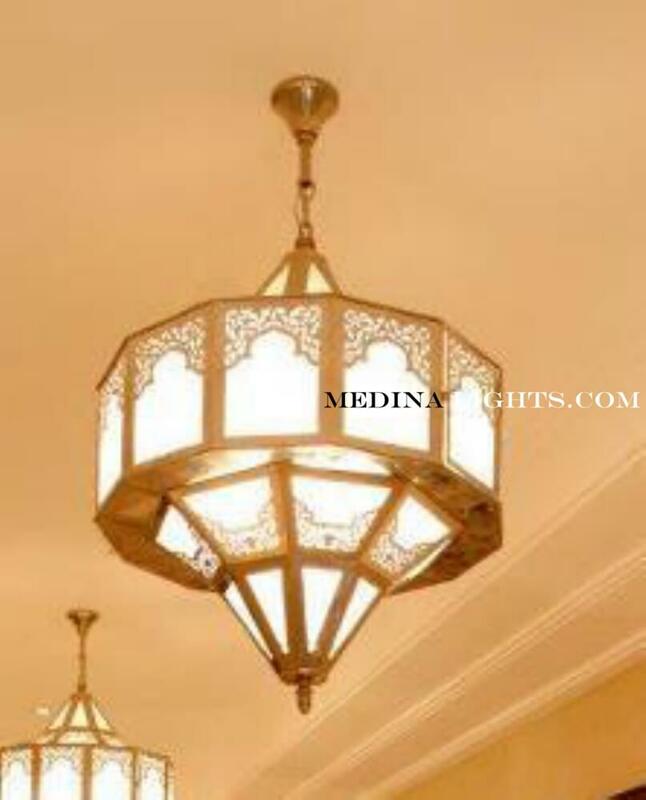 Buy Moroccan Lighting fixtures from, Moroccan Lighting store, medina lights!